The English curriculum is intended to serve the general needs of the liberal arts student and also provide discerning programs for the more specialized needs of students who want to major in English with an emphasis in literature, creative writing, or narrative nonfiction writing. In the last thirty years, English literary studies have changed in response to new theoretical and cultural models as well as greater attention to Anglophone international and non-canonical literature and genres. In our courses and major we approach the study of language and literature as a dynamic, living, and lively pursuit, one that integrates political, social, philosophic, cultural, and aesthetic values. We have designed a program that meets a variety of needs and enables students to pursue a variety of personal and professional goals, whether defined by individual or collaborative intent, subject breadth or depth, instructional model, source engagement, writing development, or other pedagogical features. The faculty in English participate actively in the General Education Program, the Writing Program, Women's and Gender Studies, Black Studies, Queer Studies, International Studies, Environmental Studies, and service learning opportunities. All students may enjoy readings and lectures made possible by the endowed Harriet Ewens Beck Fund, which has brought such writers as Susan Orlean, Ted Kooser, Alice Walker, Bill Bryson, Maxine Hong Kingston, Adrienne Rich, Louise Erdrich, and Antonya Nelson for visits or residencies each year. The curriculum in English is also enhanced by a variety of opportunities for students to pursue publishing their works locally in a variety of student-edited journals. ARTICULĀTE (a forum for cultural and literary criticism) and EXILE (a journal of creative writing) are among the publications associated with students in English. Students who major in English must choose an advisor in the English Department to assist them in selecting and sequencing classes to meet their academic and professional goals. All students who major in English must complete a minimum of ten classes in the department, excluding W 101 - First-Year Writing Workshop. The English major and minor each have two options: the literature emphasis and the creative writing emphasis. The two courses of study overlap and complement one another. 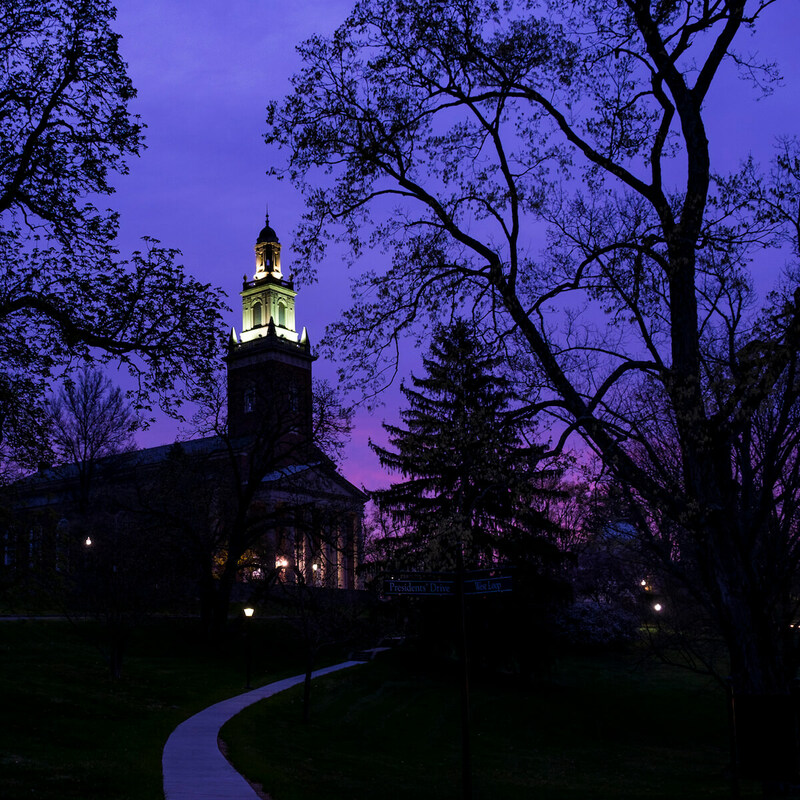 Both literature and creative writing students should graduate from Denison with a strong knowledge of the history and practice of literary studies. Each semester, students who want to take classes in English should read the semester's course descriptions, available online and from the English office, which provide more detailed information about specific classes than what appears below. Students who major in English with the Literature emphasis must take ten courses. Four courses are chosen from among the five core courses: four of those courses are historical survey courses that cover a variety of periods in English and American literature; the fifth course introduces students to literary theory and critical methods. Critical methods and literary theory are taught in many courses in the major, but ENGL 202 - Literary Theory and Critical Methods provides an overview of literary theoretical debates, familiarity with some primary theoretical texts, and attention to research and critical practices in literary studies. This course is recommended for all students, particularly those who want to take advanced courses in literary theory or plan to pursue graduate studies in English. All students with the Literature emphasis are strongly urged to begin their coursework with the required "four-of-five" courses that provide useful historical and theoretical contexts for subsequent, more focused study in the seminars. However, because specific 300 level seminars are probably not offered every semester, students are encouraged to take seminars, even before they have completed the required surveys, if they are interested in the topic. ENGL 400 - Senior Seminar is the English capstone course offered every semester on a variety of topics. Students who major in English with the Literature emphasis may choose to do a year-long senior research project in literary studies (ENGL 451 - Senior Research - ENGL 452 - Senior Research). Students can transfer only two courses to the Major from off-campus. Students who major in English with the Creative Writing emphasis must take ten courses. English majors with a Creative Writing emphasis will read and write extensively, learn from practicing published writers, and hone their skills while studying a wide range of literary texts. Students majoring with an emphasis in Creative Writing will choose from a variety of courses divided among workshops and literature courses. The core of the creative writing courses is the workshop. Writing students take a series of increasingly advanced workshops to culminate, in the senior year, in a year-long writing project conducted on campus. The senior capstone is ENGL 453 - Senior Writing Project - ENGL 454 - Senior Writing Project in which students complete a collection of their work (poetry, stories, drama, and/or nonfiction) by year’s end. English majors with the Creative Writing emphasis must take three 300-level English seminars. ENGL 400 - Senior Seminar can count as one of these advanced seminars. ENGL 383 - Fiction Writing, ENGL 384 - Creative Nonfiction Writing, or ENGL 385 - Poetry Writing: students choose either Fiction Writing, Nonfiction Writing, or Poetry Writing. (Students may, if their schedules permit, take more than one of these advanced workshops.) Students may not take any of these courses concurrent with the Senior Writing Project. English 453-454 serves as the capstone experience for English majors with the Creative Writing emphasis; this 8-credit course consists of weekly group workshops, individual tutorials, a monthly colloquium and practicum, as well as a series of master classes and workshops with visiting writers. Students must submit a writing sample and show reasonable progress in creative writing courses at the end of their junior year to get permission to take the year-long senior project to complete the major with a Creative Writing emphasis. To minor in English with a Literature emphasis, students must take three of the five required core 200 level courses (see above) and three courses at the 300-level (one may be at the 400 level). To minor in English with a Creative Writing emphasis, students must take ENGL 237 - Introduction to Creative Writing, one advanced writing workshop (ENGL 383 - Fiction Writing, ENGL 384 - Creative Nonfiction Writing, or ENGL 385 - Poetry Writing), two of the five required core 200-level courses, and two courses at the 300-level. ENGL 400 - Senior Seminar can count as one of these advanced seminars.